Publish more video, for free. Your content economics should make sense. Let the community report on the events you cant cover and use Rapid Replay’s video content and players to make money in the process. Copy, paste, done. Thank you! We will be in touch shortly to schedule a demo and get you up and running with Rapid Replay! Cover more events with video than ever before. 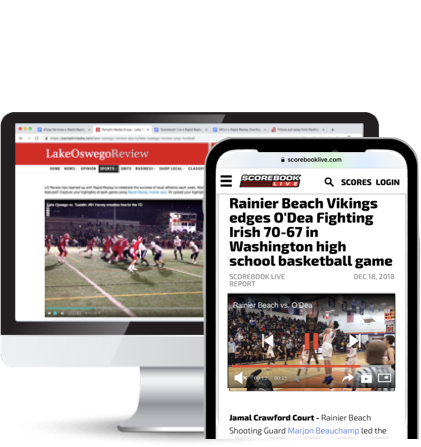 Embedding a Rapid Replay video player on your news website, blog, or database is as easy as copy and pasting one simple line. Add a highlight player to your home page for real time plug-n-play videos. Embed it once and you never have to worry about it again. Add a game recap player to any article for video coverage as an event occurs. We’ll send you a code for each game requested and the videos will populate as they’re uploaded. Publish more video. Make more money. Rapid Replay videos create some of the most lucrative ad spots on the internet . Make the most of that attention. Have an existing ad sales team or video ad exchange? Let them sell sponsorships, pre-roll advertising, watermarks around the Rapid Replay videos. Need some help? Let Rapid Replay supply programmatic video ads to make sure you’re in the black whenever you work with Rapid Replay. Click Get Started to leave your information, and we will be in touch shortly to answer any questions you have and get you the access you need to start using Rapid Replay! © In Game Technologies, Inc.